The scenic Natchez Trace Parkway is renowned for its unspoiled, natural beauty. Stretching diagonally across the state from Natchez to Nashville, Tennessee, a total of 444 miles, the Parkway follows an enchanted route through lush forests into the heart of Mississippi’s past. First used by Native Americans thousands of years ago and later a major trade route during frontier days, the Trace is lined with markers that point out important sites and detail the fascinating history of this ancient route, including portions of the 19th century path. 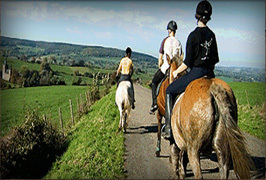 There are many ways to travel along this scenic byway including hiking, biking, driving or riding. 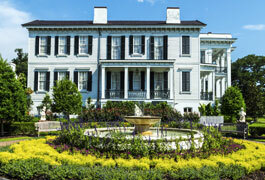 Tour the magnificent antebellum homes and opulent mansions of Natchez. Take a carriage ride through historic downtown or go shopping for period antiques. You can also visit Natchez Under-The-Hill, where the saloons and scandals of yesteryear have been replaced by colourful shops, quaint restaurants and a gaming casino. 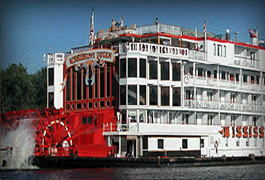 While here you can also enjoy spectacular views of the Mississippi River. Don’t miss the Ruins of Windsor where you can see the remains of the largest antebellum mansion ever built in Mississippi. And for a historical photo opportunity visit Rocky Springs, near Port Gibson. Take a driving tour highlighting the historic Hinds County Courthouse, from 1859, and the Dupree House dating back to 1878. Raymond also has walking tours of the Confederate Cemetery and the Civil War battlefield offering unique glimpses of 1863. Travellers of the Natchez Trace can stop at a beautiful welcome centre displaying the history, pride and progress of Clinton. Jackson Mississippi, the state’s capital, boasts such attractions as the Mississippi Agriculture & Forestry Museum / National Agricultural Aviation Museum, The Mississippi Museum of Natural Science and the Governor’s Mansion. Visit the Mississippi Craft Centre which showcases a colourful array of traditional and contemporary Mississippi crafts. 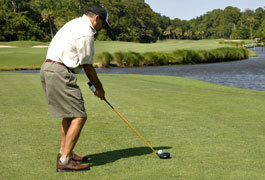 The Trace winds along the beautiful Ross Barnett Reservoir, home to some of the best water sports. For a striking photo opportunity, be sure to stop at the Cypress Swamp. The Kosciusko visitors centre includes a permanent display on Tadeusz Kosciuszko, a Polish freedom fighter and a Natchez Trace Parkway exhibit. One of the first communities founded along the Trace, the French Camp dates back to 1812 and was used as a campsite by General Andrew Jackson. The village includes an 1846 log cabin, a visitor’s centre, crafts, a sorghum mill and the historic home of Colonel James Drane. The Parkway’s headquarters and visitors centre chronicles the centuries-old history of the Natchez Trace. While in Tupelo, visit the birthplace of Elvis Presley, the King of Rock and Roll, and view a life-size statue of Elvis as a 13 year old boy. Continue your journey along the Natchez Trail through the foothills of the Appalachian Mountains and the serene beauty of Tishomingo State Park.